Flyers, leaflets and posters are a great value marketing product as the relatively low costs allow for larger print runs and in turn greater customer awareness. 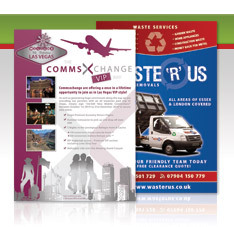 Our creative team can design your flyer, leaflet or poster to meet almost any specification, ranging from a standard single-sided budget promotional flyer, to a completely bespoke shape leaflet with specialists finishes. To complete our design service we offer first-class lithographic printing in full colour on a range of materials, and with a variety of finishes and specialist enhancements through our Appletree Print division. We can print on our standard 100gsm or luxury 120gsm bright white bond paper, or, for an even more luxurious finish, we also provide letterhead printing on a wide range of Conqueror papers, including the ultra-polished, sleek to the touch Smooth/Satin collection and the natural and tactile Texture collection. We use the highest quality lithographic printing process to ensure quality is very high indeed. Your creative and corporate flyer and leaflet designer will talk in-depth about your requirements, taking into account any ideas you may have. Your flyer designer will begin work on your flyer design and email you the flyer concept board within 48 hours. Once you have viewed the initial concept you may discuss any changes with your flyer designer and he/she will continue to revise your flyer design until you are happy (unlimited revisions). Once you have signed off the flyer design, your flyer designer will prepare for either print or send. If you have selected printing, your flyer will be printed and sent to you. If you have selected design only, your final flyer design will be prepared in high resolution print ready format and emailed to you.